Many homeowners tend to change the interior of their houses every few years. They repaint the walls a different color, get new curtains, buy new furniture, the list goes on and on. One area that doesn't get a frequent make-over is the bathroom. This is one area where a new coat of paint simply isn’t enough and a new bathroom takes a lot of work and can be quite expensive. Still, the effort may be worth it. A new, more modern bathroom can add a whole lot of value to your home and even if you don't plan on selling it, a change in decor will give your whole home a new lease of life. When it comes to bathroom renovation, sometimes you can get lucky and re-use some of the existing fittings. 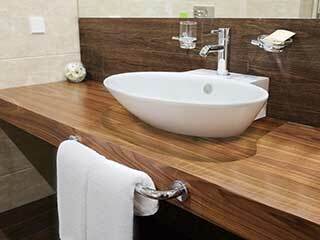 Check your toilet, shower and sink to see if they can be incorporated into the new bathroom. The money you'll save on not needing to replace some of these parts can go towards better quality fittings that do need to be replaced. This is without a doubt the most time consuming and messiest part of bathroom renovations. More often than not, the tiles will shatter as they are being removed so you will not be able to reuse them anywhere. Plus with all the shattered tiles everywhere the clean-up will be quite extensive. In most cases, it will simply be easier to get the drywall sections removed as well, particularly if you are making changes to the layout of the plumbing. A leaky bathroom can spell disaster for other areas of your home. Fortunately, these days there are dozens of products available to seal the area and prevent leaks. Once your plumbing has been completed and checked, and your water-resistant drywall has been put in place, you'll probably want to have silicone applied to all the joints and then have the waterproofing membrane set up. Waterproofing these parts will be incredibly useful and will help you avoid a lot bigger issues later on. If done right, you will have a great bathroom for many, many years without any mold or water damage. To get this project completed quickly and expertly, simply contact our experts at Drywall Repair & Remodeling Hollywood, CA today.